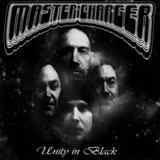 Toiling from Nottinghamshire, and relatively unnoticed for the last few years, the UK band Master Charger is back with their third full-length Unity in Black for which they could have easily requested their moniker to be changed to Master Riffer. Located at the boundary of the 60s psychedelic stoner and the early 70s when the first three or four Black Sabbath albums redefined heavy music in the UK, Master Charger often capture the feeling of anybody who ever picked up the guitar and created heavy bluesy bliss (Journey through All Tomorrows). Punctuated with the periodic well-placed solos often developing into convoluted jams (Super Death Charged, Journey through All Tomorrows) and laced with JHP stoned out of his mind vocals, Master Charger unveils some of the densest heavy stoner metal you would hear. On par with Lair of Minotaur in the density department, Master Charger’s guitars are where you found bass tuned in the case of many other bands. The bass has its own prominent role to play on Unity in Black, audible throughout, and getting to play individual little vignettes (Shadowmass, I Ride with Vengeance). The music on the album rarely picks up speed. There is a shorter quickie Deal with It, and some punkier Motorhead moments on Shadowmass and otherwise bluesy Journey through All Tomorrows, but mostly the speed stays slow and swampy, to delve even deeper at times into the sticky warbling and grumbling molasses (So High Yet So Low). There is also a certain amount of sloppiness in the Master Charger tunes, appropriate for the band playing this style of music. The band loves to introduce the song’s main riff early – as if saying “look what we just came up with” – and then play off and around it (Unity in Black, I Ride with Vengeance). The songs maybe tend to linger a little bit too long, Master Charger drying to drill the repetitive riff deep under the cranium. Somewhere out there I saw a notion that Master Charger plays a working man heavy metal, and that definition would be entirely appropriate. Do-it-yourself blue collar nature is all over this effort and if you happen to live on the American side of the Atlantic, there is also something southern, something fried and New Orleans in this dirty and gritty guitar oriented stoner. The individual songs are not all as captivating as the bookends Super Death Charged and Journey through All Tomorrows, but the overall sound is worthy of your attention if you are a fan of the genre.